Filter element for insertion into an aquaduct side profile. The filter unit is very easy to install and can be removed and cleaned at any time. To install the filter simply remove the plexi cover of the aquaduct and insert the filter element into the left side profile. A seal on the filter element effectively prevents coolant passing without being filtered. 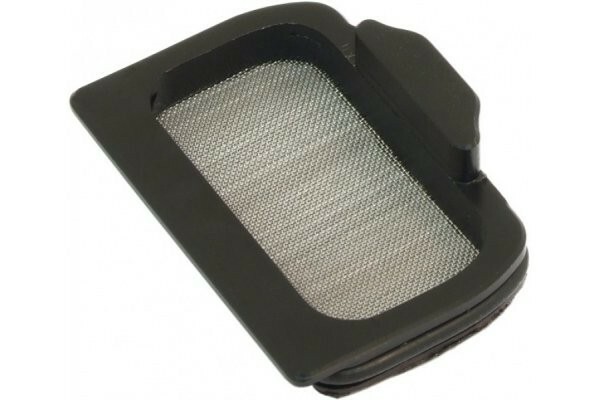 For cleaning the filter unit can simply be removed and cleaned with e.g. a brush. The filter mesh is firmly attached to the Delrin frame. Even though the mesh is extremely fine the flow is barely obstructed, the reduction is approx. 1%. Flow control is recommended to notice a clogged filter. Durch das sehr feine Gewebe, was sicher gut den Dreck aufhält, baut sich im Deckel ein leichter Wasserdruck auf, wodurch das Wasser durch die Dichtung rausgedrückt wird. Auch eine neue Dichtung brachte keine Abhilfe. Außerdem muss die Einfüll-schraube offen bleiben weil nach dem Abschalten nicht genügend Luft vorhanden ist um den Pegel auszugleichen. Ich werde auf einen externen Filter umsteigen, weil dieser mehr Probleme verursacht als löst.